SS 3, 47300 Petaling Jaya, Selangor, Malaysia. Sundays and Public Holidays: Varies. Kindly drop us a WhatsApp message on 01133118945 to ask about our operating hours, as it depends on staffing arrangements. Kindly note that we do not practice having check-in/out during busy festive days. This is to make sure we have a peace of mind at our home, while letting our dogs here enjoy their furcation blissfully during major holidays. Make arrangements for your furkids to arrive/to be picked up at our home one day prior/after the Public Holidays. Kindly note that we do NOT entertain walk-ins without scheduled appointment. Kindly contact us inquiries at 01133118945 via Whatsapp/SMS/call to make necessary arrangements. Check-in and check-out for furkids also strictly adheres to the time set and agreed so we can have a peace of mind at home. We dedicate a great part of our time caring for all the dogs here at our home. And as for first-timers at our home, we would like to offer first time Day Care or Boarding stay at 50 % off to fur-mama and fur-dada who are serious about our services. Lucky came in for an assessment today and passed with flying colors. 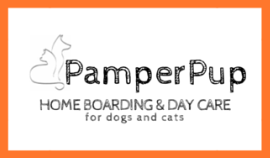 Lucky's boarding at PamperPup will happen 3 weeks from now. Lucky's mommy and daddy agrees to send Lucky over to PamperPup tomorrow for a trial stay (can be a one-day Day Care, or a one-night Boarding as a trial pre-stay). This first time tria stay will be at a 50& off. We provide updates during his stay, and a report to mommy and daddy about Lucky's adjustment and behavior during his first time stay here at PPP. When Lucky comes back for his boarding stay in 3 weeks, Lucky will already be familiar with PPP as his second home while his parents are away. This practice will provide ease and comfort for both furkid(s) and parent(s) while they are apart and in a new environment. This is to allow family member at PPP to have ample time to bond with new furkiddos. It takes time for furkids to get used to a new environment, and for them to trust their new carers. This introductory staycation at PPP will allow furkids to understand that PPP is their new second home, and that their fur-mama and fur-dada will come back to pick them up after their respective vacations. Essential items to present: vaccination card which shows up-to-date vaccinations, heartworm preventions, internal parasites preventions and tick/flea preventions. Your furkid will also have to be COMPLETELY TICK/FLEA-FREE upon check-in. ​​Also, kindly fill in this form goo.gl/forms/RiVNA05AaG about your furkid. We thrive to create a comfortable and exciting furcation for your furkids while you are away on your work trips/vacations. So contact us at 01133118945 to enquire further (WhatsApp messaging is preferred in case we do not answer your phone calls).